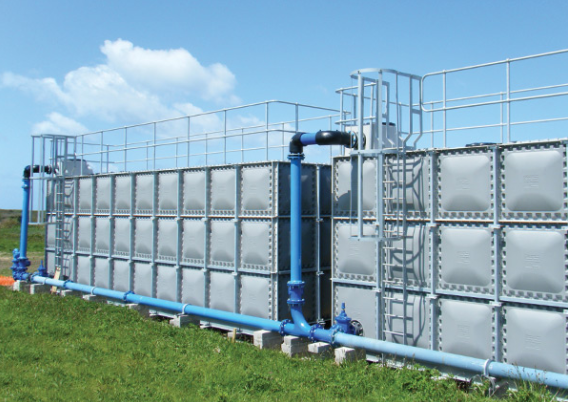 CubicM3 has a range of solutions for Cold Water Storage (CWS) Tanks. We have expanded our CWS offering to now include Glass Reinforced Plastic (GRP) Sectional Panel Tanks and GRP One Piece Tanks. We supply and install a range of sizes and volume capacities. ​In response to customer feedback, CubicM3 has also developed a range of drip trays made from tough and durable polypropylene. We manufacture our bespoke drip trays to suit your unique requirements. Contact our sales team today for more information on our CWS and GRP products. Our bespoke GRP sectional tanks can be pre-insulated, ranging from 1m³-10,000m³ litres capacity and erected to a height of 4m in 1m and 0.5m increments. These tanks are designed and manufactured to BSEN 13280 standards. They carry WRAS approval for potable water storage and LPCB and FM approvals for fixed fire fighting sprinkler systems. All panels are fully tested to resist pressures in excess of six times their working pressure. CubicM3 can also provide external ladders that fully comply with relevant safety standards. GRP one piece tanks are manufactured to BS13280:2001 standard using high quality glass reinforced polyester (GRP) resins.